Earn $18.89 in VIP credit (1889 points)What's This? Tubus racks are strong, beautiful and lightweight. It's no surprise these German-made carriers have become the basic equipment of any top quality touring or commuting bicycle. The Cosmo features a stainless steel construction that's not only tough as nails, but easy on the eyes as well. 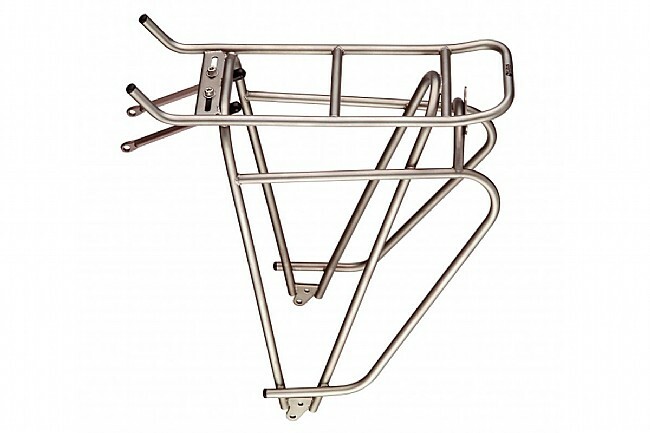 Its shape is similar to the Logo model, making this rack a great option for riders with heel clearance issues on smaller bikes or racier frames. A large platform provides ample cargo space on the top of the rack, and an additional pannier mounting bar provides a lower center of gravity for improved stability with heavy bags. The Cosmo has also undergone extensive testing with the industry's leading designs for totally vibration-free performance with all common pannier attachment systems. Thin walled stainless steel tubes easily tote enough gear to take you across the country - or around the world - without tacking superfluous weight on to your rig. New super light mounting hardware drops a few more grams. The load capacity for the Cosmo rack is an impressive 88 lbs (40kg). Weight: 649g without included hardware (148g). Fits bikes with 26" to 700c wheels. All Tubus racks are backed up by a 30-year Worldwide Guarantee against technical failure. Please see the Tubus website for warranty details. Is this thing gorgeous or what? I bought this rack for my cross-country tour a few years ago before we carried Tubus here at BTD. I admit, I chose it in part for its stunning good looks, but let me tell you, this rack is SOLID. Installation was straightforward and painless, and it hasn't budged since - haven't even had to tighten the screws. No rattling or vibration whatsoever. When I tour, I carry two heavy Ortlieb panniers PLUS a drysac containing my tent and sleeping pad across the top. Nice mount for my tail light, and the little lift on the platform at the back keeps it visible even when the rack is loaded with stuff. Plenty of attachment points for various panniers. This is a whole separate category from the cheap aluminum rack you've got on your commuter. A whole new world! Very nice stainless steel rack. The installation was a piece of cake and there is a great place to attach the rear light. Expensive but definitely a quality rack to last many years.